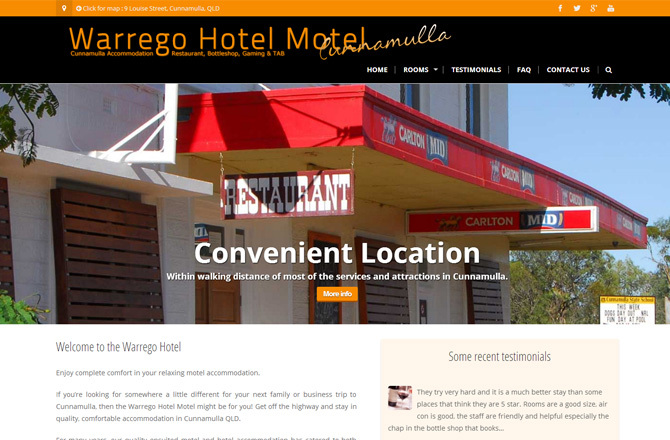 The Warrego Hotel provides quality, comfortable accommodation in Cunnamulla QLD. In 2015 they contacted Partner Digital because their current website was looking dated and also needed to work with a new booking system. Partner Digital was able to design and build modern mobile responsive website that met all their requirements. “I chose Partner Digital as our web designers for a recent upgrade of our current website. That was completed in December 2015. It is now the middle of February and the increased sales from the site have already paid for the job. I initially chose this company after reviewing a number of sites they had built. The sites were very visually appealing and this is important for our type of business. I found Tom Young, the owner, knowledgeable and easy to work with. He focused on my goals and also made recommendations to improve the performance of the site. He did a lot of research on the booking and payment system at no cost and the project was delivered on budget. In summary, the finished product was a visually attractive site that works seamlessly on mobile devices. So far it has a very low bounce rate, which means we are getting the right people to the site and is converting more lookers to buyers. At the end of the day, it’s all about results and I am happy with the results Partner Digital has delivered for us.